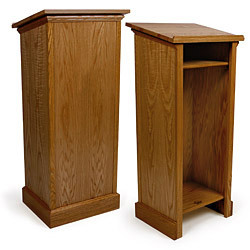 These dark oak pulpits are made of real wood and feature an attractive finish. 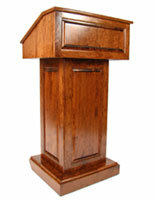 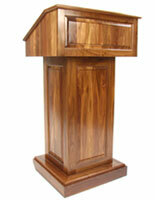 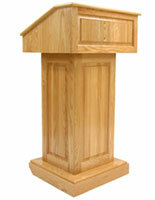 Each floor standing lectern is mad ewith a 3-step spray process that makes them water resistant. The oak pulpits come with an angled ledge for keeping presentation materials and an open shelf for other supplies. 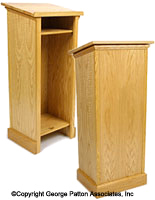 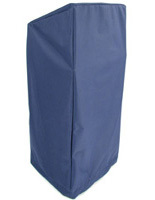 Poiums like these are often found in churches, schools and other venues that require a simple but attractive stand. 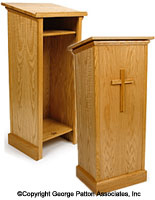 The wood pulpits require minior assembly by screwing the top ledge onto the rest of the body. 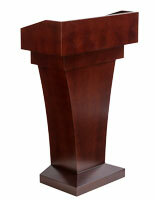 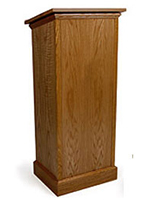 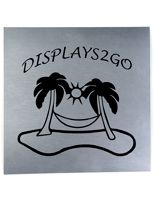 The floor standing lecterns with a shelf come with all the required setup hardware.